From Goodreads ~ Mike Filey's column "The Way We Were" first appeared in the Toronto Sunday Sun not long after the first edition of the paper hit the newsstands on September 16, 1973. Now, almost four decades later, Filey's column has enjoyed an uninterrupted stretch as one of the newspaper's most popular features. 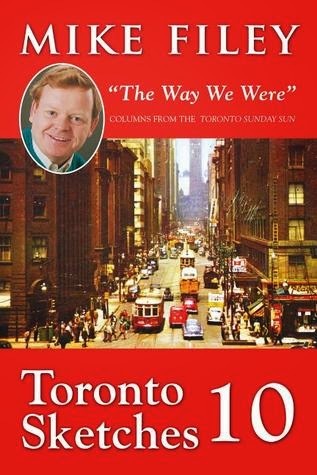 Mike Filey had a column in the Toronto Sun for about 30 years and I read it for many years (I like learning about the history of Toronto) ... this book is a compilation of some of his columns. In this book, we learn about motel alley on Lakeshore Blvd., how Teraulay Street became Bay Street, where Babe Ruth hit his first professional home run, ferries, Gibraltar Point Lighthouse (I've been in it! 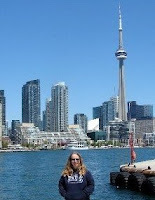 ), Gooderham and Worts, Toronto's changing skyline and lots more. He also talked about the Toronto Central Prison, which is in my 'hood. It opened in 1873, when the area was still well away from any residential development. The prison was intended as an industrial facility and began with the manufacturing of railway cars for the Canada Car Company. Hard work and discipline were considered the best forms of rehabilitation and active industry would raise money for the prison. The prison should have flourished as an example of modern penal facility of its time but by the 1880s it had a well-deserved reputation for brutality. Its first warden, William Stratton Prince, was an alcoholic ex-military officer who resigned as chief of the Toronto Police to take the position. During his tenure, he would be accused of ordering extreme beatings, denying medical treatment and supporting clandestine nighttime burials. Wardens that followed tried to adopt a less disciplinarian approach but the guards continued to brutalize the inmates. 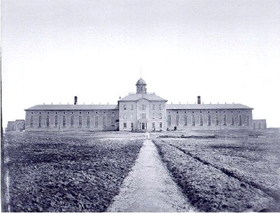 In 1915, the prison was abandoned as changing attitudes toward crime and punishment led to a revamping of the province’s correctional system and replaced by the Ontario Reformatory in Guelph. For the next five years, the facility was used as an army base and a processing centre for new immigrants. In 1920, the main prison building was demolished and much of the land sold for use by the railroads. Remaining buildings ended up being used by Hobb's, Dr. Ballard's and finally by John Inglis and Company Limited until 1981. 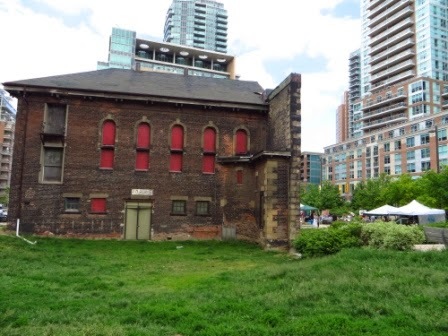 All that remains today is the Central Prison's Roman Catholic chapel (added to the main building in 1877) and the Paint Shop, which became part of the city’s inventory of heritage properties in 1985. Even though the book was published in 2010, it was still an interesting book because it dealt with many historical events in Toronto. If you live in Toronto or are from Toronto, you should check it out.